If your tastebuds are looking for adventure this week, pop by Punjab Grill and savour the Kashmiri specialties on showcase right now from 16-24 April 2014. They have flown in a special chef and the ingredients from the region, and oh what exotic flavours they've conjured up! I'm starting with the end: this amazing Kehwa tea poured from a "samawar" or samovar. This metal (normally copper or brass) charcoal teapot has an inner chamber filled with live coals, somewhat resembling our charcoal steamboat pot in concept, but holds tea instead. In the cold climes of Kashmir, this helps keep tea warm for longer. Hot tea in chilly weather, what bliss that must be. The Kehwa tea (no, it's not chrysanthemum!) is a sweet green tea with cardamom, almonds, saffron and other spices. Supposed to be very good for digestion, and it tastes beautiful. Reminds me of 八宝茶 (Eight Treasure Tea) with all the herbal goodies. 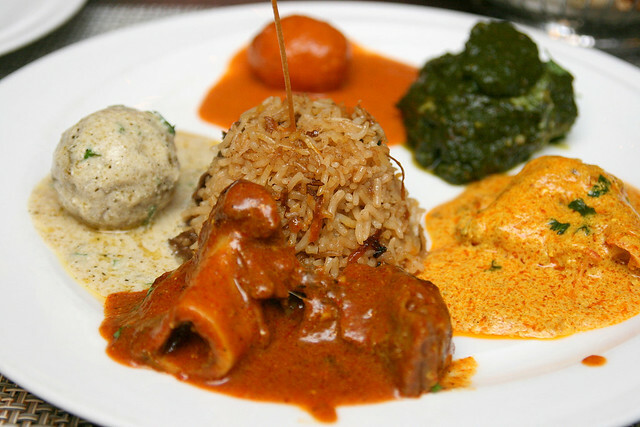 As for the food, Kashmiri cuisine is slightly different from Northern Indian cuisine. It's heavy on lamb and yoghurt, but interestingly, the curries are lighter. The use of spices also differ - not so much garlic, onions and ginger, but more cumin, fennel, asafoetida, and even sandalwood. Kashmiri Kukur Tikka: Kukur means chicken in Kashmir - say it out loud and it makes sense! These are tandoori-like boneless chicken thighs marinated with kashmiri whole red chili paste, enhanced with green sounf (fennel?) powder, finished in a clay oven. Tabakh Maaz: this is a traditional royal Kashmir method of cooking lamb. Here's the lamb ribs have been marinated with aniseed powder and saffron milk. The meat is first boiled for tenderness, then roasted and pan-fried for a crispy exterior. The lamb's natural flavours are really enhanced. Wazwani Handi Aluv: a tender tandoori-roasted potato reserved overnight in fennel powder, marinated with ginger garlic paste, sprinkled with saffron kewda milk. A signature of Kashmir Valley, this is pan-grilled lotus root or stem marinated with red chili and dusted with roasted mint leaves, but the kicker ingredient is sandalwood. The lotus root patty smells and tastes of incense. I almost feel like chanting. Gucchi Pulao (centre): I have never had pulao or pilaf rice so delicious before. A fragrant combination of jumbo morels (wow, wait, morels? yes, these mushrooms are in Kashmiri cuisine too, but just as rare and expensive!) and royal cumin in basmati rice cooked on dum under flaky puff pastry. Dum Aluv: very much a Kashmir dish - dum aluv are potatoes simmered with fennel seeds, dry ginger and Kashmiri chili gravy. This may seem like a simple potato, but it's lipsmackingly good. Gadh Palak: the dark green spinach puree tempered with mustard seeds is phenomenally savoury and tasty; I could so eat it on its own without the gadh (fish). Rogvan Josh: the famous Rogan Josh (one of my absolute favourite dishes) is a much loved specialty of Kashmir. This version has shoulder of baby lamb cooked the old fashioned way over extremely low heat. It's spiked with a melange of freshly pounded spices including fennel and red chili (hence its colour). Gushtaba: I am learning all kinds of new food names here. 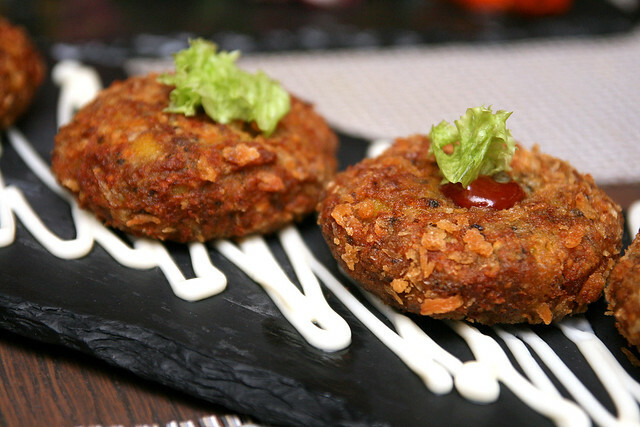 The Gushtaba is a finely minced mutton meatball or dumpling spiced with green cardamom and fennel. It's served with a creamy curd-based sauce. Apparently a lot of work goes into the preparation. The mutton is beaten with a wooden hammer until it reaches that velvety consistency. Personally, though, it was a little dry and paled in comparison with the rich flavours of the other dishes. 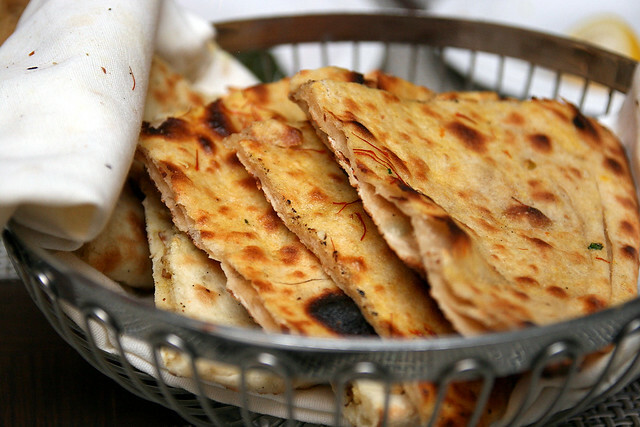 You get a basket of breads/naans too - and what a luxurious basket it is! Saffron paratha and Kashmiri breads stuffed with dried fruit and nuts. 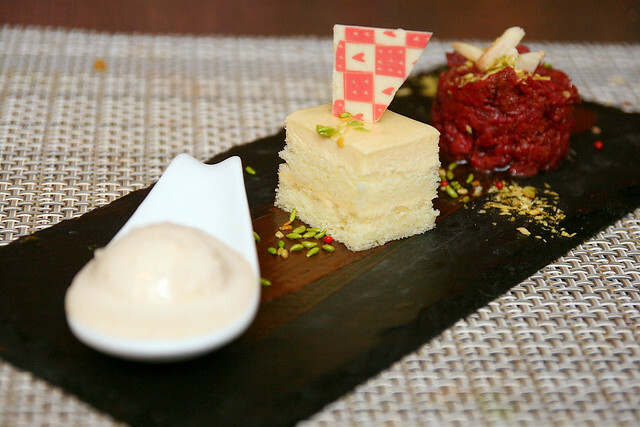 Desserts are usually not a highlight in Kashmir, but the chefs have done marvellously with this trio. The spoonful of kulfi (left) is pleasant but it is the Chukander E Afroz (right) or beetroot halwa that amazes. It is a burst of flavours at once foreign and familiar, just like many of the dishes before it. We tried to pry what ingredients went into it. There is a touch of condensed milk in it - ah, that explains the comforting feeling. Look at the colourful candy coated cumin seeds scattered across the platter. Cute! After dessert you get that lovely Kehwa tea. I so want to make that a ritual at home too. 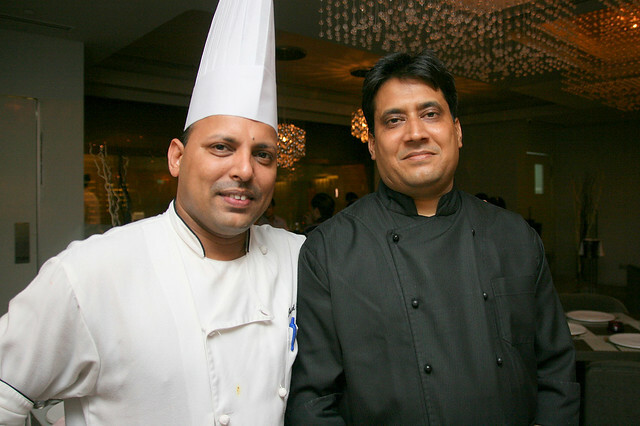 This menu is the collaboration of Punjab Grill's Executive chef Javed Ahamad (left) and guest chef M Rehman above. Kudos for a wonderfully executed meal. Indian food can be heavy, but good Indian food is worth every calorie. 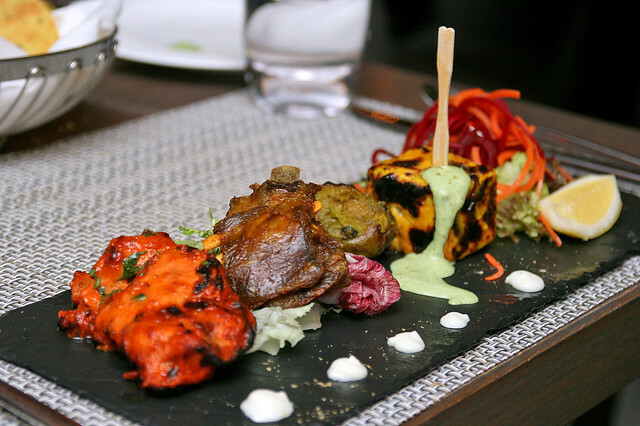 I can't wait to go back and explore Punjab Grill's regular menu - they're more focused on Northern Indian cuisine, but I'm glad they had this Kashmiri detour.